A common use case for Pimcore applications are portals with user logins and a complex permission structure like for example b2b portals. One way of archiving this is to leverage Symfony Security functionality with access control configuration and ACLs as described here. But, it might be handy to empower admin users to configure and maintain user permissions themselves. And therefore, Pimcore data objects are also a great choice. Just create an user object and define permissions directly on it or via relations to other permission role objects that are assigned to the user object. So how to integrate Pimcore objects, a roles & rights system and Symfony best practise to implement complex permission structures for Frontends based on Pimcore? See the Pimcore docs for how to integrate Pimcore objects with Symfony Security in general. Here you see how to authenticate against a Pimcore user object. 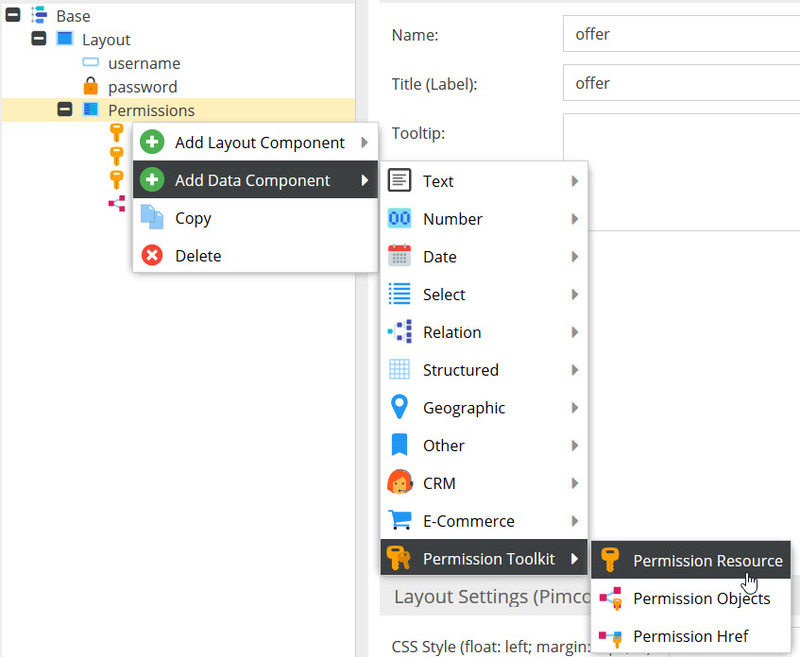 Use the Frontend Permission Toolkit for configuring permissions directly within the user objects by using the new data type permissionResource. A permissionResource represents one specific user right (e.g. login, show prices, order, etc.) and can have the values allow, deny and inherit. allow: User has this permission. deny: User doesn't have this permission. inherit: Permission is inherited from linked other permission objects (see next). In addition to configure permissionResources directly in the user object, it is possible to create additional object classes (e.g. UserRole) and link object with the type UserRole to user objects. A UserRole might look look similar to the following example and contain permissionResources for itself. The userRole objects can have permissionResources with he name like these in the user object (in this case values are merged as described below), or can have additional permissionRessources. 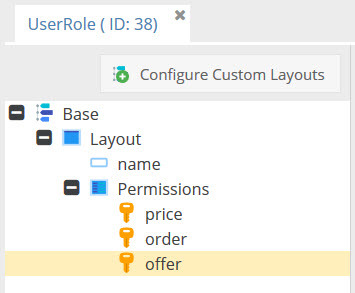 To link userRole objects to user objects, use the new data types Permission Objects or Permission Href instead of default relation data types. This allows the Frontend Permission Toolkit Service to recursively resolve the permissions of a given user object. To complex permission structures can be set up with Pimcore objects. Returns an array of all permissions for the given object (e.g. user object), automatically merges all permissionResources of objects related to the given object with Permission Objects or Permission Href. Merging: When permission is set to allow / deny directly in the object, this is used. Otherwise optimistic merging is used, means once one permission is allowed, it stays that way. PermissionResources are matched by their field name. Integrate permissionResources to Symfony Security as Roles: There are several ways to integrate the object permissionResource permissions into the Symfony Security system. One would be to implement a custom voter as described here. The simplest (but maybe not prettiest) way would be to return all allowed permissionResources of an user object as roles of this user. In this case you can access this information everywhere in the Synfony framework. For details see docs in the Frontend Permission Toolkit. Integrate permissionResources to documents and Pimcore navigation: For details see docs in the Frontend Permission Toolkit.